The Xantrex Freedom X 2000 offers premium performance in a lightweight compact package. 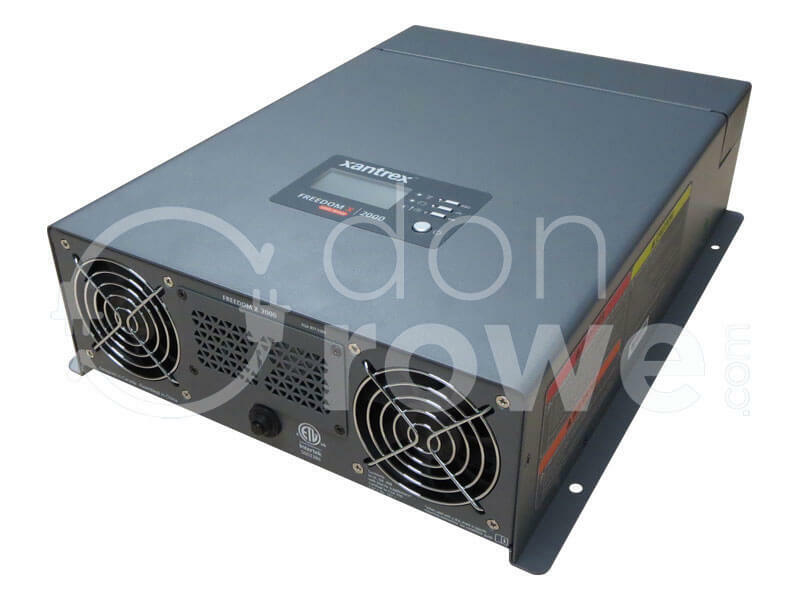 This inverter provides up to 2000 watts of continuous utility grade, sine wave power from a battery bank and is designed to handle loads such as microwave ovens, TVs, DVD/Blu-ray players, and power tools. In addition, the Freedom X 2000's extended 2 second high-surge capability lets you handle many hard-to-start loads, including full size residential refrigerators. The Freedom X 2000 has a built-in 30 Amp transfer switch that automatically transfers between inverter power and shore power from recreational facilities such as boat docks or campsites to ensure power is always available. If incoming shore power is interrupted by external events like brownouts, the Freedom X 2000 automatically becomes an independent power source that supplies utility grade AC power to your loads. The Freedom X 2000 offers comprehensive built-in protection features to safeguard your batteries from unnecessary drain while protecting your equipment. Features include selectable low battery shutdown voltage, low voltage shutdown delay timer, power save mode, low battery voltage alarm and shutdown. The Freedom X 2000 is also features configurable AC transfer speed, output frequency, and voltage, making it extremely versatile.